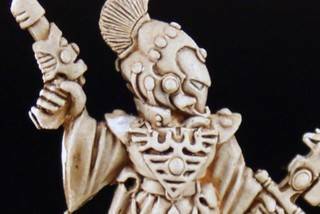 Painting Tutorials | Azazel's Bitz Box. Lester Bursley’s Wash Recipe and Tutorial (repost). EVERYTHING BELOW THE LINE IS LESTER BURSLEY’S ORIGINAL CONTENT. NONE OF IT WAS WRITTEN BY MYSELF. FULL CREDIT TO LES FOR HIS WORK AND BEING WILLING TO SHARE HIS KNOWLEDGE WITH THE COMMUNITY. This is a cut-and-paste repost of a post made by Lester Bursley on Dakka, back in 2009. Some of the links may no longer work, but all of the information therin is still relevant, and incredibly useful. While I do buy range of commercial washes from Games Workshop, P3, vallejo and others, I also make my own using Les’ recipies and based off of Les’ recipies. I also keep a bunch of dropper bottles of ready made medium – just waiting on the ink for when I need to replace or make something new. 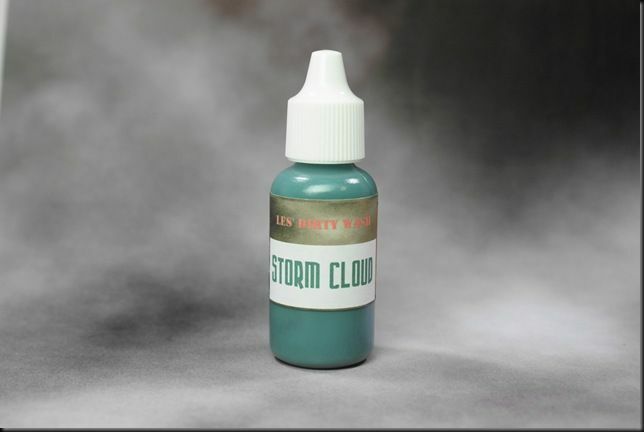 bottles; anywhere that sells Vallejo / P3 paints will sell empties. *2 filler bottles – Finding it bizarrely hard to find these online; anyone want to help? All recipes use 1 oz bottles. Adjust to whatever size you decide to go with. *Fill 1 filler bottle with Matte Medium, the other with a 10:1 Distilled Water and Flow Aid. with the Water/Flow Aid mix leaving a little room for the ink drops so you dont over flow. Every bottle uses this combination to start with. *Shake inks well before adding them to the mix. 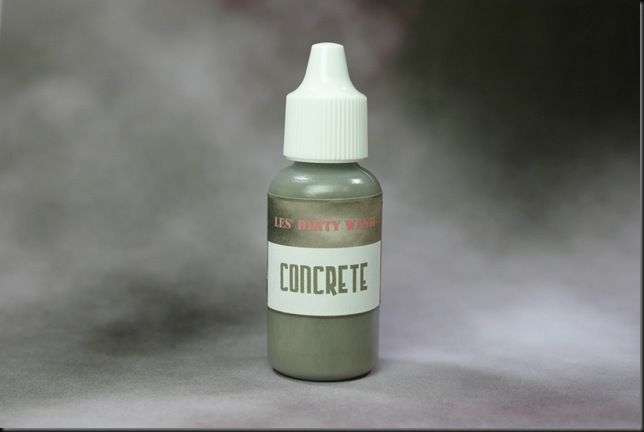 -THIN WASH: Opposite of above, more water than medium in mix. My mixes will give you a starting point and you can customize to your liking from there. the most flexible wash production that you can do at home. 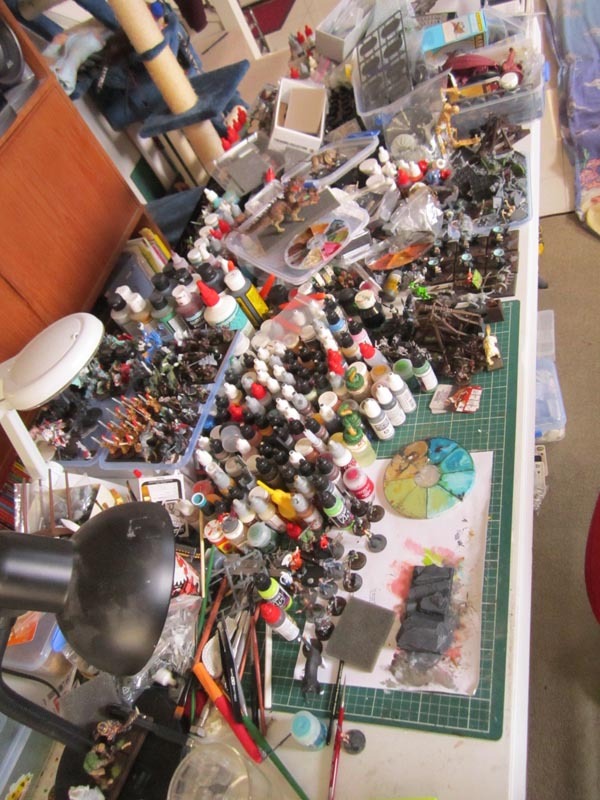 I just read the latest post from my mate Faust over on his Double Down Dice blog – Tool Tips 09 – Paints. I saw that Lionoversuskingkong had posted something about Army Painter paints, and replied, and then was going to go on and reply in some detail to DDD and his post – and then had the thought – I’d talked about a lot of this in the past – in the comments section of Luke’s Start Your Meeples board game review blog. So then I decided to just copypasta the stuff I wrote in Luke’s blog, “Remix” my thoughts, and turn it into a “response video”-type post to DDD’s post, as an entry on my own blog. Now everything I write here is completely 100% correct and true. I’ve been painting for a long time now, and I know what I’m doing, while still being open to learning new techniques and continuing to improve. 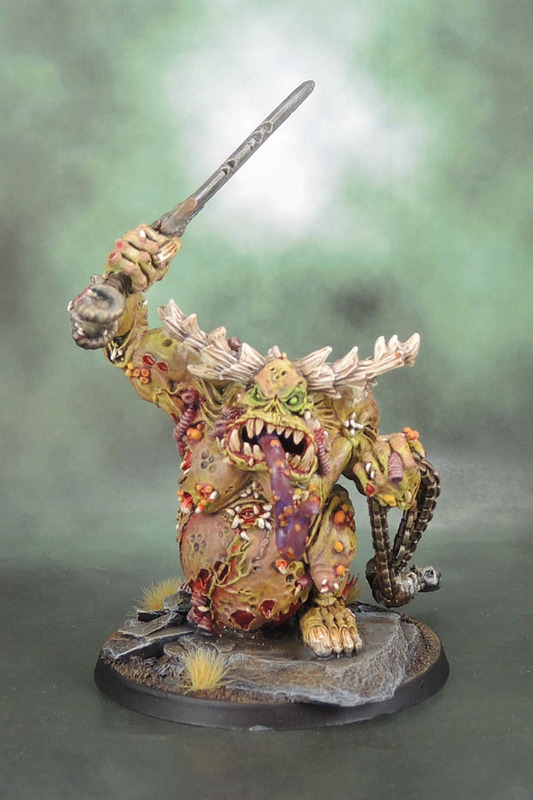 I’m not going to win any Golden Brush or Crystal Demon awards anytime soon, because I don’t paint in the “competition” style. Maybe I could? I’m sure I could go down that path, but I’m not actually interested in competition painting. I’m interested in good quality models for my own table, use and blog. 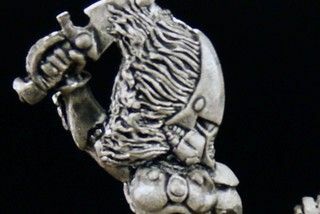 I see some amazing work from pro painters and people who strive to make each model better than their last – and that’s awesome for those who choose to go down that path, but many painters of that type often finish a dozen or fewer models per year. Which for me is not going to get me a game of The Warhams with two fully-painted sides clashing. So like I said. Everything I state here is true. But it’s true for me, in my own experience. In one particular Tabletop Minions video, Adam asks a bunch of Pro Painters for tips on improving. Which is an interesting 10 minutes, but if you watch it, you’ll see that a lot of these Pro Painters offer contradictory advice. Some only use cheap, disposable brushes, others swear by the Pure Sable, Windsor & Newton Series 7. What they state in that video is also 100% true, and factual. For them. It’s a kind of different thing to opinions, in that they (and I in this post) aren’t talking about favourite colours, but actual, factual things and techniques that work. For each person. Watch it, or don’t! 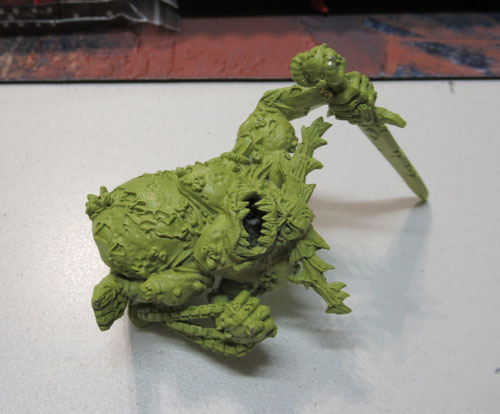 Spray prime your models – don’t do it with a brush if you can avoid it. 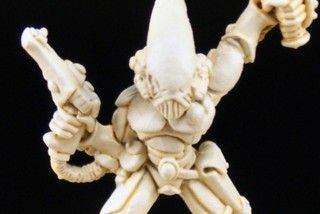 Black and white paints that you paint on with a brush are radically different to using a proper brush-on primer, and again different to using a spray. Just use the spray. Sprays stick to the models much more effectively than painted-on primer or undercoat. 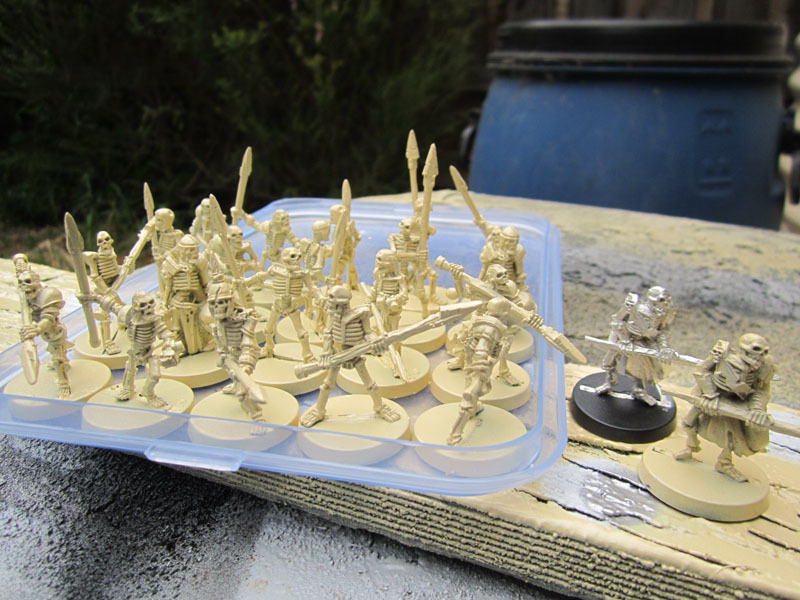 Get three cans of primer (cheap spray paint from the hardware shop works – you don’t need GW’s expensive cans). Black, White, Grey. Make sure they’re all matte, not gloss. I use hardware shop cans for most models, and have some Tamiya ones for “extra special” models. 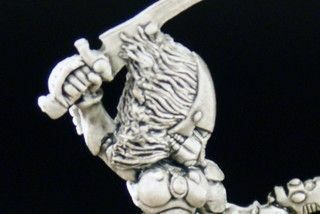 Unless you’re going to pre-shade with zenithal highlighting (and you should try it sometime, anyway). 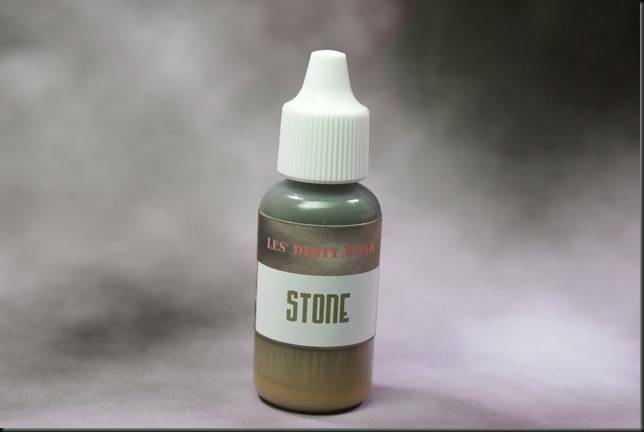 Just choose the colour most suited to the dominant base colour paint you’ll use. White for bright and light colours, black for dark colours and metals, grey for “in-betweens” and… you’ll get a feel for it. Reds and pinks get white. It’s probably also worth having some “good” primer as well for those special models. I use either/or Tamiya or Gunze or Mr.Surfacer from “normal” model shops. At the same time, most models aren’t “special” and don’t need it. 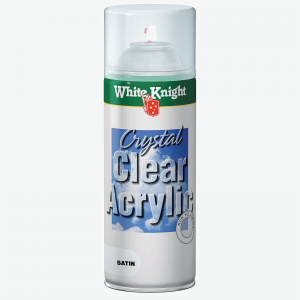 If I’m painting a whole lot of something in particular, I’ll often follow up on a black or white initial coat with a coloured (or metallic) coat. It’s a hell of a lot faster, and gives you a pretty decent base coat that you can still touch up and continue to paint over. I’ll use another cheap can from the hardware store if they have an appropriate colour – but if they don’t, I used to buy a can of Tamiya Spray, or Citadel, or another hobby brand. Now, I go to the local paint specialist store (Paintaway is my local) and go through their book of colours, and choose the exact shade of custom colours that I want. Sure, the cans cost AU$30 each, but so do the Army Painter Sprays, or the Citadel, or the Plastic Soldier Company, or… and the Tamiya ones are cheaper, but tiny. 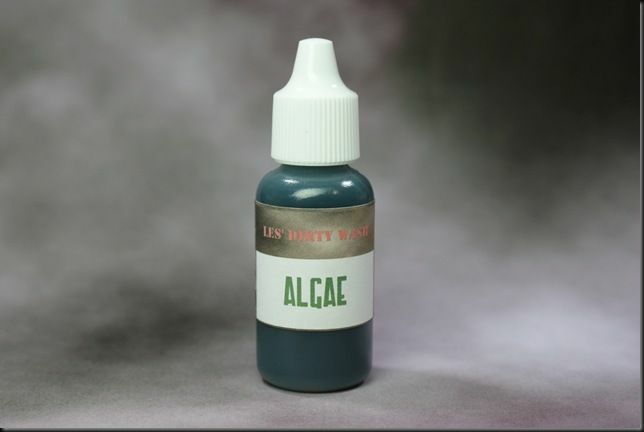 Also, I can always go back and get the same mix and don’t need to worry about them discontinuing the colour that I’ve been using (unlike GW/Citadel). I personally don’t like Army Painter sprays. They sandpaper your models’ surface too easily if you spray from too far away, and I’m just not into spray can brands that need special snowflake instructions in order to function as well as the cheap stuff from the local hardware store. Other people find the Army Painter sprays to be perfectly fine, and so, you know, good for them. Genuinely. I can’t and won’t personally recommend them though – as I have better options available and feel that anything that doesn’t require special snowflake instructions is a better option. Over many years I’ve seen a lot of people complain about GW sprays being inconsistent or sandpapering their models and such. 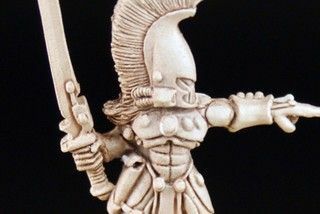 I was always fine with them, but don’t bother anymore – because as I’ve noted, I can just get custom cans from the paint shop which is much closer than a GW or any GW stockist. Here’s a couple of great videos from Luke of Luke’s APS on how to use Spray Cans properly. Including the cheapest brands he could find in the UK. Matte is completely fine as long as you don’t go too thick. You want a bit of tooth for your brush paint to get onto. 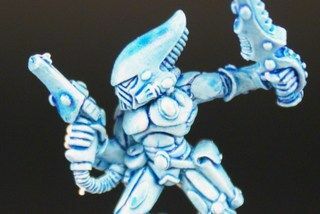 Gloss is only good if your first step is going to be to wash the models, but can have its place as a coloured undercoat that is also a basecoat. Satin is my go-to. You can also cheat with a gloss base spray by then going over it with a satin mid-coat, and then continuing to paint. Some people live in places where spray cans don’t work very well, due to humidity or temperature which may or may not be seasonal. 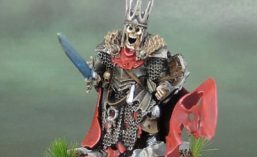 I often see airbrushes recommended here, and I’d probably agree, but I’m hot garbage with an airbrush and I find it a massive pain in the arse to set mine up, especially for priming a few figures, and so I just never end up doing it – so I’d suggest that they’re right, but can’t speak from personal experience. 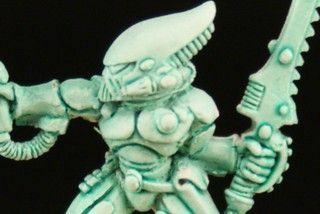 I suspect that airbrushed primer would be a bit less hardy than sprayed-on stuff, which is another reason that I just don’t bother. But then the climate that I live in means I don’t need to worry about it. In winter, it’s a pain in the arse waiting and hoping for a weekend when it’s going to be warm and dry enough to spray. The weekend because I’m usually still at work during the warmest part of the day, it gets dark early (and spraying at night time, even with a porch light isn’t the greatest), dry because I spray outside and can’t do it in the rain (obviously). Sometimes this means I build up a backlog of a couple of weeks worth of stuff to varnish and undercoat, and so on those rare days, I seem to be out there constantly, spraying this and that. And then leaving them to dry forever. Yeah, I can see the appeal of using an airbrush! This has now gotten a bit longer than I’d anticipated, and I haven’t even gotten onto the paint that you paint on with a paint brush yet. So I’m going to call it here and do a follow-up post on that in the next couple of days. Otherwise I’ll be here all day, and I’ve got pressing stuff to do.